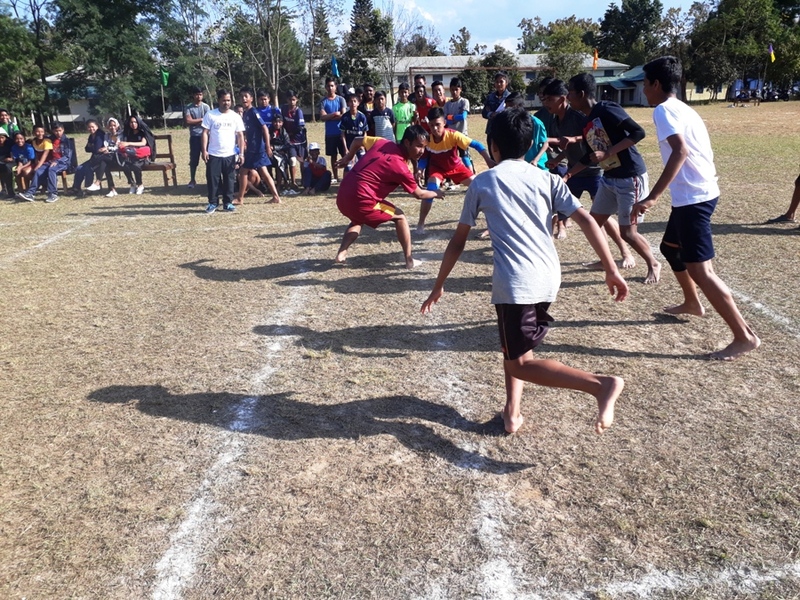 The sportsmanship event of VKV Umrangso, the “Sports Meet” of the session 2018-19 finally gave the clarion call on 27th December 2018 to all the students and teachers. The inaugural ceremony of the meet began with lightening of auspicious lamp and offering of flowers at the portrait of Swamiji by honourable HOP(NEEPCO) Sri Debotosh Bhattacharjee, DGM (Civil,NEEPCO) Sri Mohan Dihingia and Vice Principal of the Vidyalaya Sri A R Choudhury. It was followed by welcome speech by the Vice Principal highlighting the importance of games and sports and wished all round development of the students. It was followed by felicitation of the respected guests with Phulam gamosa by the Vice principal. The flag of the sports meet was hoisted by hounorable Debotosh Bhattacharjee sir and thereby observed the march past by the four houses and mass drill by the students. 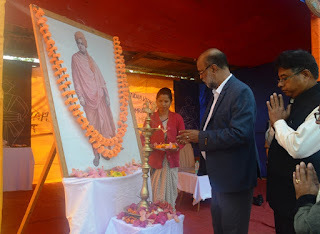 It was followed by a number of events – Oath taking by the chief commander and captain of the four houses, inaugural song, yoga pyramid, dance by students etc. There was a prize distribution ceremony on the occasion where the distinguished guests gave away the prizes to the students (KG-III) who won medals in various events earlier. The chief guest of the Sports Meet delivered an inspiring specch and asked the students to give importance to games and sports along with their studies. During the meet the students took part in various events – 3000m Race, 1500m race, 400m Race,200m Race, 100m Race, Relay Race, Long Jump, Shot Put, Kho-Kho, Kabaddi, Discuss Throw, Chess, Badminton, Table Tennis, Football etc. and showed their talents. Prizes were given away every day after the events were over. So on 28th December respected Hindi Officer from NEEPCO Sri Vishon Thapa attended the prize giving ceremony and gave away the prizes. On 29th December 2018 Sri Amrit Bora, Deputy Manager NEECPO graced the prize distribution ceremony and gave away the prizes. On the concluding day respected B K Chakraborty (DGM Electrical) and Branch Manager (SBI Garampani) Sri Manoj Patir attended it and inspired the students by their valuable words and gave away the prizes to the winners. A few prizes were given by the vice Principal Sri A R Choudhury. Finally, Sri B K Chakraborty Sir retreated the flag of the meet and it was handed over to the Vice Principal by Sri Paban Pegu (Physical Education Teacher).